I watched the trailer before watching the show..because I have never heard of it and also,just to make sure it's not horror movie haha! 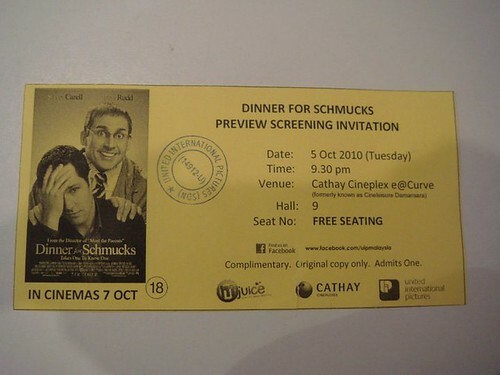 Synopsis : "Dinner for Schmucks" tells the story of Tim (Paul Rudd), a guy on the verge of having it all. The only thing standing between him and total career success is finding the perfect guest to bring to his boss' annual Dinner for Extraordinary People, an event where the winner of the evening brings the most eccentric character as his guest. Enter Barry (Steve Carell), a guy with a passion for dressing mice up in tiny outfits to recreate great works of art. From Jay Roach, director of "Meet the Parents" and "Meet the Fockers" comes an unforgettable feast about two unlikely friends and one very memorable dinner. I had a good laugh in the show..it has lots of hidden meaning and it's really like a grown-up show..It needs lots of understanding and concentration..some people may find it bored but for me,it was actually quite an interesting show..funny! haha!